BARCELONA, Spain — Barcelona needed goalkeeper Marc-Andre ter Stegen to put in a superb performance as the Spanish league leader failed to score and dropped points at Athletic Bilbao in a 0-0 draw on Sunday. The result ended Barcelona's run of 37 league games where it scored at least one goal. Its last league game without a goal was a 0-0 draw with Getafe on Feb. 11, 2018. Barcelona has now drawn three games in a row and is showing signs of fatigue as the season enters a critical phase. It was held 2-2 by Valencia in the last round and drew 1-1 with Real Madrid in their Copa del Rey first-leg semifinal on Wednesday. The defending league champions left San Mames Stadium six points ahead of Madrid, which is hitting its stride and moved past Atletico Madrid into second place by winning the capital derby on Saturday. Ter Stegen made one-handed saves to deny Markel Susaeta and Inaki Williams in each half. "I had to stop both of them, one way or another," Ter Stegen said. The Germany goalkeeper did all he could — and then some — to turn away Susaeta's long, dipping strike in the 17th minute that looked goal-bound until Ter Stegen leapt back toward his far post and stretched up to palm the ball over the bar. He added a fine reflex stab to parry Williams' close-range shot in the 82nd. He also had two more routine saves to stop Raul Garcia's bicycle kick and another late effort by Williams. "You have to play very well to take a point from Barcelona, but the best chances were for us," said Bilbao coach Gaizka Garitano, who has turned the Basque Country club around after taking over in December. "Ter Stegen was outstanding. They have a great goalkeeper who made two excellent saves." Lionel Messi returned to Barcelona's starting lineup after playing just the final half-hour against Madrid midweek. Messi had been doubtful for that cup match after an unspecified leg injury picked up against Valencia. 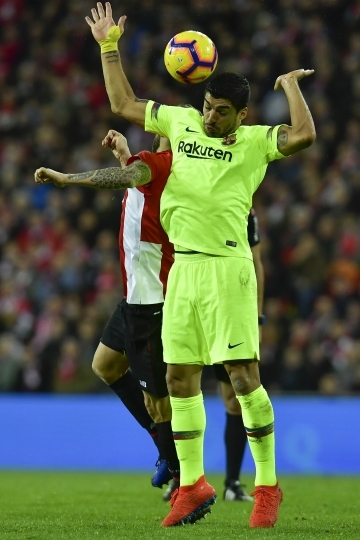 Messi provided Luis Suarez with a well-placed cross that the striker was unable to connect with in the 22nd. 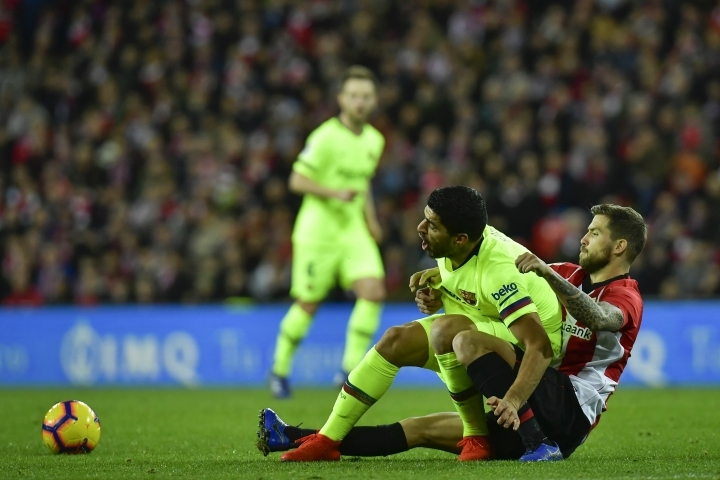 Messi was sent tumbling to the turf by Bilbao's defenders on several occasions, as they refused to let him reach the area in a scoring position. "Leo is fine and played at 100 percent," said Barcelona coach Ernesto Valverde. "It was difficult to break through the wall of defenders they put in front of him." Messi provided the only threats from a Barcelona that was missing the attacking verve of right back Jordi Alba and the control provided by midfielder Arthur. Alba was serving a one-game suspension while Arthur is sidelined for around a month with a muscle injury in his left leg. "We weren't communicating well enough in the first half," Suarez said. "We missed passes, both myself and other players." Midfielder Arturo Vidal was particularly sloppy in his passing and was substituted in the second half. Garitano sent on playmaker Iker Muniain for one final push that almost produced a winner by Williams — if not for Ter Stegen. "A team that is full of some of the best players in the world and that practically scores in every match, to cut that scoring streak and to see that their best player was their goalkeeper, well that is saying something," Muniain said. Ousmane Dembele returned for Barcelona after a three-week injury absence as a late substitute. Ten-man Sevilla scored twice in the final minutes to salvage a 2-2 draw with Eibar. The visitors appeared to be completely in charge after Fabian Orellana and Charles scored goals and Sevilla midfielder Ever Banega earned a second booking in the 84th. But forward Wissam Ben Yedder sparked the comeback with a goal in the 88th. Midfielder Pablo Sarabia then touched Quincy Promes' cross just enough to steer it past goalkeeper Asier Riesgo in stoppage time. The draw left Sevilla in fourth place — the final Champions League berth— two points above Getafe. Morocco striker Youssef En-Nesyri scored the first La Liga hat trick for Leganes, leading it to a 3-0 win at home over Real Betis. En-Nesyri has scored seven goals in his last five games. Leganes, a small club from Madrid, is playing its third season in the top flight. Sixth-placed Betis finished with 10 men after Javi Garcia was shown a late direct red card. Valencia drew for a 13th time in 23 rounds after being held 0-0 by Real Sociedad.